Uboldo, 6 December 2018 – The Silk Road is becoming even more Lombard thanks to LU-VE Group. 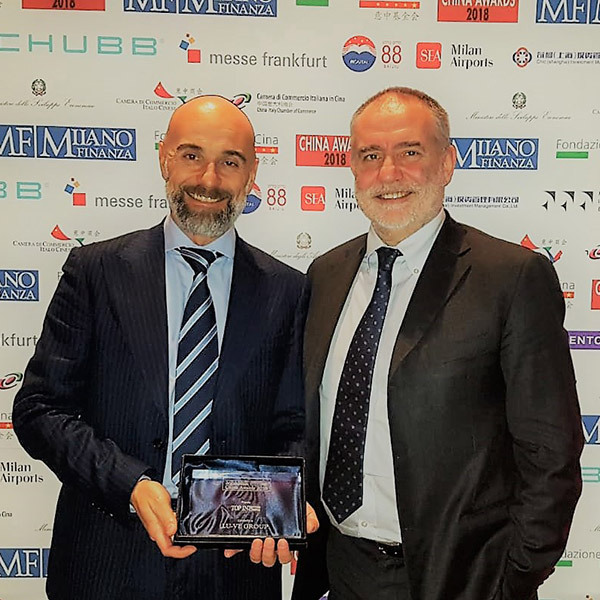 The multinational based in the Province of Varese, world leader in the business of heat exchanger manufacture, has been declared the winner in the “Top Investors” category of the “China Awards 2018”. This is the second time LU-VE Group has been recognized for its important investments in China, winning the same award also in 2015. The 13th annual China Awards ceremony was held yesterday evening in Milan, at the Leonardo da Vinci Museum of Science and Technology, organized by the Italy-China Foundation and Class Editori with the patronage of the Ministries of Foreign Affairs, Economic Development, Environment, and the Italian-Chinese Chamber of Commerce and the partnership of the Italian Chamber of Commerce in China. The hosts of the event were Alberto Bombassei, President of the Italy-China Foundation, and Paolo Panerai, Vice-President and MD of Class Editori. Amongst the guests was the Consul General of the People’s Republic of China, Song Xuefeng. The organizers of the event presented awards to the Italian and Chinese companies which had known best how to seize the opportunities of the two markets, exploiting the benefits deriving from the crossflow of capital, people, goods and services between Italy and China. The activities of LU-VE Group are particularly representative, having decided to double their production surface area in China, transferring from Changshu in the Province of Jiangsu to a new facility in Tianmen in the province of Hubei in south-central China. In total, the new base will have over 19,000 sqm., 15,000 sqm. for production, a two-floor office building of 2,000 sqm., and another 2,000 sqm. for dormitories and the company restaurant. Development plans include, from 2021, possible expansion of another 10,000 sqm. This year there are 29 winners of the China Awards in 9 categories: 19 Italian companies and 7 Chinese. The Gold Lions (reserved for the world of culture, sport and entertainment) went to Paolo Genovese for the great success of his film “Perfect Strangers”, to Daniele Garozzo, who won the gold medal in the foil category of the fencing World Championships in Wuxi, and to Sofia Goggia, women’s downhill skiing World Champion, who is expected to take part in the 2022 Winter Olympics in Beijing. The China Awards 2018 was held at a charity dinner for Ai.Bi. – the Friends of Children Association (a non-governmental organization for international adoption, also from China and Project Loveast a cultural exhange programme between to sprting organizations: the Italian ASD ForMeD'Abili and the Chinese Ren’ Ai School in Suzhou, for young people with cognitive and relationship disabilities and their caregivers.